A Dam Fine Post: Happy Canada Day! 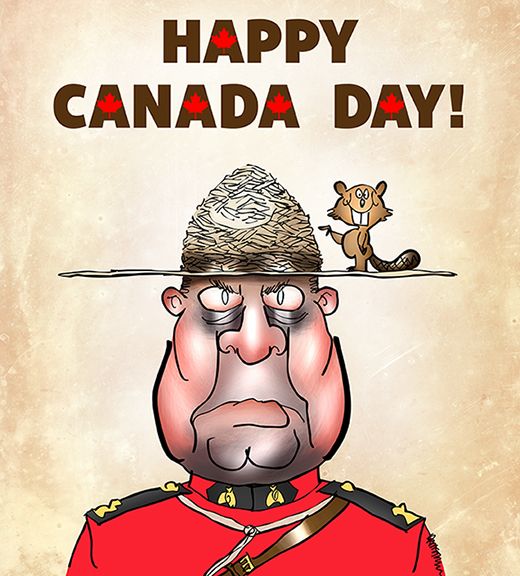 A very happy Canada Day to all my Canadian friends, fellow bloggers, and subscribers! Thanks a lot for your support, and I wish you all a wonderfully enjoyable day. Here’s a close-up detail image. What do you think? Did you know beavers get a lot of respect in Canada? Are they really that good at building dams? Hope you’ll leave a comment. If you enjoyed this post, I invite you to subscribe. You can leave a comment and click the box that says Notify me of new posts via email, click the Subscribe button below the Portfolio Thumbnails, or just click + Follow in the blog menu bar. Pen Light Sets Off Illustration Bomb! Wooden ya just know it? Another hit. Love that beaver – so cute. Had no idea that beavers commanded such respect in Canada. But after seeing the dams they build, I got to give them credit:-) Plus, they have a great work ethics….you know…being busy all the time! We enjoyed our holiday yesterday with my sister, hubby and her 3 kids. Didn’t see any beavers up in a mountain suspension bridge with rainforest tree top walk at the end of bridge. But heard lots of jokes about lumberjacks at a lumberjack comedy outdoor show on top of Grouse Mountain (which is a ski mountain) within spittin’ distance of Vancouver. We walked by a Beavertail food stall…a deep fried type of dessert. I loved the Royal Mounted Police and his beaver mascot there! (I live in a city that also has a Royal Mountaed Police museum.) Another Canadian icon and how they helped developed western Canada. But sometimes they got drunk too (like the folks they were throwing into jail). Pedal on, and thanks so much for stopping by! Mark, I love drawing animals; your beaver made me laugh out loud. This is my favorite one yet! I hope beavers can run because that mountie (is that what he is?) doesn’t look terribly pleased with the alterations to his hat. I bet mounties and beavers are equally hashed on Red Green. Thanks as always for your good-humored support! Happy Canada Day from Oz… 😉 Very late but ‘better late than never’ as the saying goes… ! 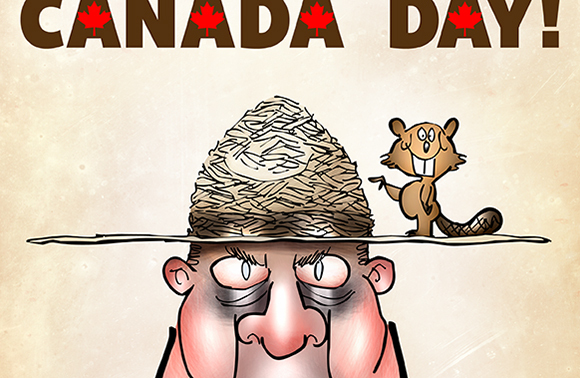 Haha – I am enjoying that ‘munchkin’ image ….. however; beavers, smeavers to funny hats and strange teeth. I love this illustration. There are beavers where I live and they are the model of industriousness. They spend 8 months of the year working on their dams day in and day out, and 4 months raising their kits. I’ve heard that expression “busy as a beaver” all my life, but have never been in a position to watch them work. From your description, I can see their reputation is well earned! HA!!!! so wonderful! LOVE the expressions! and the pun! You’re so GREAT at this!!!!! A very excellent depiction of our Mounted Police and our Beavers! If you would like a short version of the history of the beaver, waddle over to my post Thank-you, Mr. Beaver. There are a number of beavers near our cabin, and for the most part they are welcome additions to the neighbourhood. At least they are until they cut down a favourite tree in your yard, or they fell one into the power lines and the electricity is off for a while! Ha ha Mark! Leave it to Markie MacGiggles! I thought that rascally Beaver looked familiar! And I absolutely LOVE the new banner and slogan. I wish I had a cute little pencil sharpener like that! The font is also very eye-catching and unusual. So dam cool! Hey, I think that beaver jumped off the hat and got to your title! Hahahahahaha. Awesome! Wow beavers!!! like to see!!! I didn’t know about the beavers until I read this post. So thank you very much for sharing it, Mark!